Most mornings at CMA begin with the soft jingling of identification tags as Babe, a nearly 10-year-old Yorkie-mix rescue dog, follows her owner Dave down the hall to the office kitchen for a glass of water. Dave, Babe’s owner, helps her unwrap her gift from Santa Paws. Dogs are such a part of the culture at CMA that they are more likely to get a gift during our Secret Santa exchange than their owner! “Good Morning Dave, Good Morning Babe,” is a familiar refrain as members of the CMA crew begin their workday. Whether it’s Babe on the hunt for her morning tummy scratch or one of my three dogs making the office rounds to say hello, dogs are a regular part of our culture here at CMA. We have been a dog-friendly workplace since I founded the firm in 1987. I’m a dog lover. But my love of dogs was not the main reason why I chose to allow them in the office. There were bigger reasons at play and ones that I encourage you to consider for your own workplace. 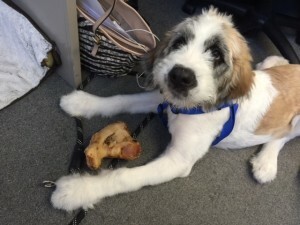 A Pet-Friendly Office Boosts Productivity: I always say that happy employees are productive employees. Sure, those who bring dogs to work will typically get up from their desks several times a day to take their dog outside, but shhh!, that’s a plus in my book. Research from sports scientist Jack Groppel shows benefits to those who get up from their desks at regular intervals. “Interspersing short movements and exercises throughout the workday can boost employee energy, engagement and efficiency,” wrote Alison Griswold in Forbes, describing Groppel’s research. Clio helps her owner Nicole answer emails. It is often true that a break, even a quick walk around the parking lot, can help relax the brain and spark creative ideas for a project. So employees who take their dogs outside periodically may be more energetic and productive. Dexter and Cali love being at the office. 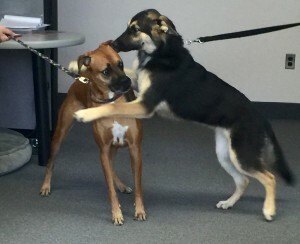 A Pet-Friendly Office Boosts Morale: People love their pets. Pampered canines get baths, regular grooming, daily walks, top-quality pet food, comfortable beds and a plethora of tummy scratching. It’s no coincidence that dogs have earned the moniker “man’s best friend.” All dogs really want is to be by their owner’s side throughout the day. 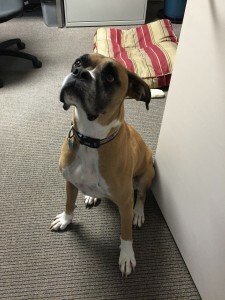 When you let employees bring their dogs to work, you are telling them they are allowed to bring their best friend to work and that is a real treat. We leave it up to employees’ judgement as to whether or not their particular pet will be a good fit in the office. But as long as they behave well, dogs are simply part of life here at CMA. Babe sleeps on a chair next to her owner’s desk in our design studio, curled up in her pink blanket and within easy access to her water bowl. Clio, a Lhaso Apso with her hair pulled into a stylish Bam Bam ponytail, generally sticks close to her cushy, fleece blanket and BarkBox, but occasionally escapes and jumps into a willing employee’s lap for a much-needed cuddle session. Lulu looks forlorn as she waits for her next treat. Every dog knows the treat trail in the office and makes their rounds. A Pet-Friendly Office Improves Work-Life Balance: It can be a challenge to leave a dog home all day. Employees who work full-time will worry about their pets during the day. They may use their lunch break to run home or have a friend or family member stop by to take the dog for a walk. But a company that welcomes dogs into the office eliminates that stress. Employees do not worry when their dog is asleep next to the desk or sleeping under the conference table during a meeting. A Pet-Friendly Office Helps Reduce Stress: Who doesn’t love giving a friendly dog a scratch behind the ears? It feels good to interact with dogs. But the reason we gravitate towards dogs and feel good afterwards may be rooted in science. According to AnimalSmart.org, playing with or petting an animal “can increase levels of the stress-reducing hormone oxytocin and decrease production of the stress hormone cortisol.” Studies have shown that when people are in the presence of a dog during stress tests or physical exams, they actually show lower heart rates and blood pressure, AnimalSmart reports. Wroxton patiently waits for his owners meeting to wrap up. At CMA it is not unusual to be at a meeting in a conference room and look around at Scott, Jennifer, Erin…and wait…there’s Wroxton, the St. Berdoodle puppy sprawled out sound asleep on the floor. You can’t help but smile. A Pet-Friendly Office Helps Employee Communication: People get caught up in their own work; it happens. The great thing about dogs is they often force us to take a break, relax and interact. One of our office dogs, Jet, has a habit of stealing other dog’s toys. As Jet’s owner makes the rounds to return toys, it naturally sparks conversation between dog owners, who laugh and commiserate over dog behavior. Sometimes those coworkers do not work together on a daily basis, but getting to know each other apart from the work improves communication and trust. 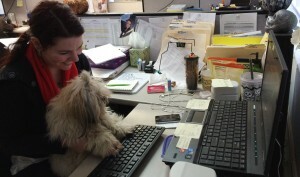 Being a pet-friendly office is part of what CMA is all about. It has helped define our culture. We work long and hard for our clients. Dogs help us keep our sense of humor, spark creativity and maintain a healthy work-life balance. 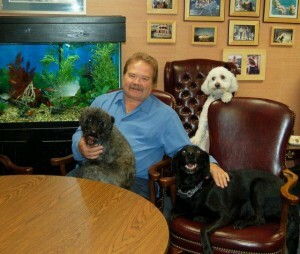 CMA CEO Jeff Barnhart and his three dogs and fish in his office. If you are on the fence about welcoming dogs into your office, I encourage you to take the leap and try it! And to all our dogs — Babe, Clio, Bode, Sophie, Abby, Lulu, Dexter, Cali, Jet and Wroxton, thanks for being part of CMA!